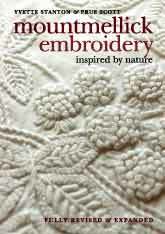 Mountmellick embroidery is traditionally edged with a characteristic knitted fringe attached to the buttonhole edging. This video tutorial shows how to make Method 2 from our book Mountmellick Embroidery: Inspired by Nature, which also features step-by-step instructions for two other knitted fringe methods. The book also includes information about appropriate knitting needles and knitting cotton, and how to attach the fringe to the edge of the Mountmellick embroidery. Following the knitting of the lace, the technique used to create the fringe is quite ingenious, and never fails to cause jaws to drop when demonstrated! As this is a traditional technique, unfortunately we can't take the credit for dreaming it up. You can purchase the knitting cotton used in the video, which has been selected for its good twist, lack of fuzziness, and complete lack of shine, making it the perfect cotton for knitting the Mountmellick fringe.